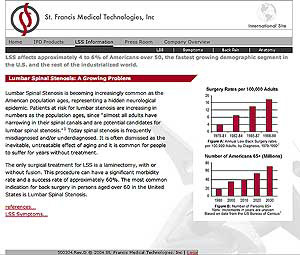 The project at St. Francis was to redesign their existing site - the old site had a claustrophobic visual design, and login requirements created a lot of barriers that prevented the user from accessing information that the client wanted to present. Although they have some very computer literate people working there, the WYSIWYG generated code made their .asp pages extremely difficult for a human to read, so they weren't able to make simple updates on their own. The complex tables of the old site also made the pages very slow to load, creating yet another obstacle for the user.